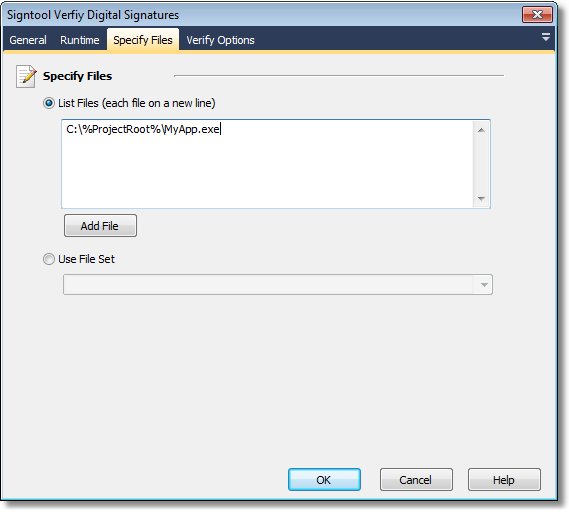 The Verify Digital Signatures action allows you to verify digital signatures that have been applied to files. Specify the files which you want to verify (each entry on a new line). • All Methods - Use all verification methods to verify the files. • Default Catalog Database - Find catalog from default catalog database. • System Component Catalog Database - Finds the catalog from the System Component (Driver) catalog database. • Catalog Database GUID - Provide a GUID to identify the catalog in the catalog database. • Catalog File - Specify the catalog file. • OS Version - Use the operating system version to verify the file. The format for this value needs to be passed in the following way: PlatformId:MajorVersion:MinorVersion.BuildNumber (build number is optional). Note: This option can only be used when one of the options above is used. • Default Authentication Verification Policy - Self Explanatory. Note: Cannot be used with the Verification Policy GUID option. • Warning If Signature Not Time Stamped - Self Explanatory. • Verification Policy GUID - Specify the GUID that matches the Action Id of the verification policy to be used. Note: Cannot be used with the Default Authentication Verification Policy option. • Subject Name of Root Certificate - Specify the subject name of the root certificate that the signing certificate must link to.